Exciting research has been published in the British Medical Journal (BMJ) that validates the Alexander Technique as an effective treatment for long-term back pain - better than painkillers, physiotherapy, massage or exercise alone. The Study was published in the BMJ on 20 August 2008. You can watch a short video made by the study team below . The Parkinson's Disease Society has funded research into the Alexander Technique, as has The Foundation for Integrated Medicine. The Migraine Trust, The Dyspraxia Foundation, The Marfan Association UK, The Scoliosis Association (UK), and many other patients' self-help groups acknowledge the value of the Technique. The British Association for Performing Arts Medicine endorses the value of the Technique in the management of performers' medical problems. Leading specialists in the field routinely refer their patients for Alexander lessons for a wide variety of disorders. The Technique is taught routinely in all the major drama schools. The Society of Teachers of the Alexander Technique (STAT) website has a range of other research papers also. Several teaching hospitals include the Alexander Technique in their study modules and there are a growing number of Alexander Teachers working in hospital clinics and GP surgeries. A high quality clinical trial carried out in an experimental setting has demonstrated the therapeutic value and effectiveness of Alexander Technique lessons for chronic back pain. 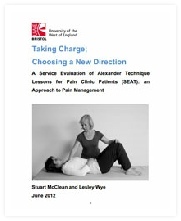 The findings of the research, published in June 2012 by the University of the West of England (UWE), suggest that the Alexander Technique is feasible, acceptable, and beneficial in terms of improving quality of life and improving patients management of pain. What are the authors’ findings about the clinical and cost effectiveness of the treatment? which also contains some good footage about what the Technique is all about. For example, more than half the pain clinic patients involved in the Study stopped or reduced their medication (reducing the pain-related costs to the NHS by half). Learning the Technique also led to behaviour change and changes in awareness and self-knowledge which further reduced the impact that the pain had on their daily life.